The World Terror Committee is known for quality as from the early years, but 2014 is a top-year for this label. Some material I reviewed this year was for the likes of Thy Darkened Shade, Tortorum, Dysangelium, Ascension, Sargeist etc. (check the site to find out…), and without exception I was very pleased (some more than others, evidently). Now this label will release the album Fire & Brimstone by a new project, called Principality Of Hell. And it might be too easy to call it a side-project of Thou Art Lord, for the three members of Principality Of Hell are in Thou Art Lord as well. But at least one can label them as ‘super-band’, and this is why. Vocals and bass are done by no one else but Georg ‘Magus Wampyr Daoloth’ Zaharopoulos. I used to be in contact with him more than two decades ago, and back then he was one of the most influential and notorious guys from the Greek (Black / Death) Metal scene. Georg was sort of active throughout the whole of Europe, collaborating with same-minded guys from e.g. Belgium (Gunther Theys of Ancient Rites-fame) or Finland (cf. Impaled Nazarene’s Mika Luttinen), but we do know him from, especially, mighty Necromantia (un-heavenly), or projects / bands like Raism, N.A.O.S. (superb! ), Rotting Christ etc. He is a famous producer / mixer / engineer as well, who worked with tens of famous (Greek) bands, such as Horrified, Tatir, Acherontas, Naer Mataron, Nightfall and many, many more; and this as from the very late eighties / very early nineties. Drummer in Principality Of Hell is John ‘Maelstrom’ Votsis, currently or formerly known from e.g. Thy Darkened Shade, Nadiwrath, Cross Denied, Ravencult or mighty Dodsferd, amongst others. On the site you can find some stuff from these bands which I did review lately (cf. Thy Darkened Shade, Dodsferd and Nadiwrath). The guitar player is Bill ‘El’ Zobolas, formerly of Vanity and Altar, amongst others, and nowadays also involved with e.g. Soulskinner (I will review the new album Crypts Of Ancient Wisdom in a couple of days / weeks). So, you see that the line-up of this new project is quite impressive. Unfortunately it does not necessarily mean good material. There are several ‘super-bands’ that did disappoint enormously, so one needs to be careful. But, I can assure you, do not fear. 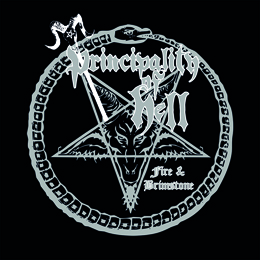 Principality Of Hell were born in order to pay tribute to the First Wave, the Black / Thrash spirit of bands like Bathory, Celtic Frost, Sodom, Venom and VoiVod. And they succeed! This album, consisting of ten compositions, lasts for forty three minutes, and convinces as from the opening song, the title track. This is Eighties-inspired Black’n’Thrash’n’Roll, fast and speedy, primal yet truly technically well-conceived. The reference to VoiVod is a strange one, I think, but one can easily add the likes of Motörhead, Kreator or Possessed to the list above. One of the many strengths, besides skilled song-writing (just grandiose hymns, all of them) and a skilled performance (not that strange, for being such experienced combo, of course), is the variation, and then I am referring to the different angles. Fire & Brimstone isn’t just only speed-up Venom-worship. Fire & Brimstone isn’t just bathorian grimness. Fire & Brimstone isn’t just a collection of Teutonic Thrash-anthems either. No, Fire & Brimstone is none of them, and all at the same time. It’s a tribute to the whole scene, to the roots of Black Thrash Glory, by means of elegies that could have been written back then. And then, the sound… With exception of the drums, everything was recorded, mixed and mastered at the RED7 Studios in Athens, and the result is fantastic, the way it needs to be: raw and unpolished, yet faultless and powerful. No noises at the background, no inferior mix for any instrument whatsoever, but no clinically trendy over-production either. Oh yes, the CD-version (that’s the one I received) ends with an Exodus-cover Strike Of The Beast (the vinyl-edition with a Slayer-track, but since I have the other version…), which is simply great. Normally I am not so easily enthusiastic about cover tracks, but in Principality Of Hell’s case, I am truly charmed.